This color-coded map indicates the depth to icy layers at a site in southern Mars. The dense, icy layer retains heat better than the looser soil above it, so where the icy layer is closer to the surface, the surface temperature changes more slowly than where the icy layer is buried deeper. 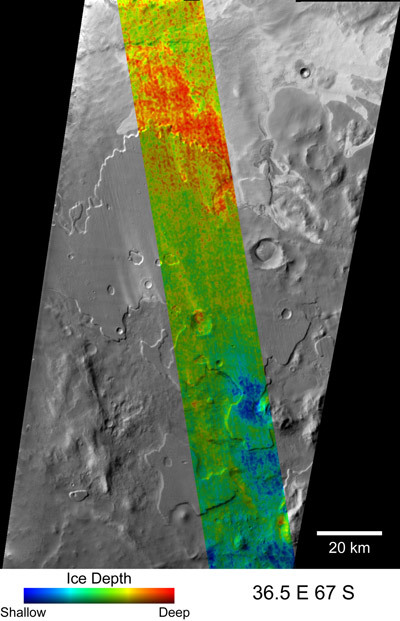 Using observations by NASA's Mars Odyssey orbiter, scientists have discovered that water ice lies at variable depths over small-scale patches on Mars. The findings draw a much more detailed picture of underground ice on Mars than was previously available. They suggest that when NASA's next Mars mission, the Phoenix Mars Lander, starts digging to icy soil on an arctic plain in 2008, it might find the depth to the ice differs in trenches just a few feet apart. The new results appear in the May 3, 2007, issue of the journal Nature. "We find the top layer of soil has a huge effect on the water ice in the ground," said Joshua Bandfield, a research specialist at Arizona State University, Tempe, and author of the paper. His findings come from data sent back to Earth by the Thermal Emission Imaging System camera on Mars Odyssey. The instrument takes images in five visual bands and 10 heat-sensing (infrared) ones. 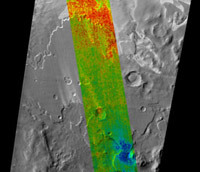 The new results were made using infrared images of sites on far-northern and far-southern Mars, where buried water ice within an arm's length of the surface was found five years ago by the Gamma Ray Spectrometer suite of instruments on Mars Odyssey. The smallest patches detectable by those instruments are several hundred times larger than details detectable by the new method of mapping depth-to-ice, which sees differences over scales of a few hundred yards or meters. The new approach uses thermal imaging as a thermometer to measure how fast the ground changes temperature during local spring, summer and fall. The dense, icy layer retains heat better than the looser soil above it, so where the icy layer is closer to the surface, the surface temperature changes more slowly than where the icy layer is buried deeper. The resulting maps show that the nature of the surface soil makes a difference in how close to the surface the ice lies. Areas with many rocks at the surface, Bandfield explained, "pump a lot of heat into the ground and increase the depth where you'll find stable ice." In contrast, dusty areas tend to insulate the ice, allowing it to survive closer to the surface. "These two surface materials -- rock and dust -- vary widely across the ground, giving underground ice a patchy distribution," he said. Computer models helped him interpret the temperature observations, he said. "They show areas where water ice would be only an inch or so under the soil, while in other areas ice could lie many feet below the surface." The results fit long-term climatic models for Mars. These show the planet has been both warmer and colder in the past, similar to glacial cycles on Earth. Bandfield said, "The fact that ice is present near the depth of stability in the current Martian climate shows that the ground ice is responding to climate cycles." In turn, he added, this implies that water ice in the ground can swap places with water vapor in the atmosphere as the climate changes. Philip Christensen of Arizona State University, Tempe, principal investigator for the Thermal Emission Imaging System, said, "Scientists have known for more than a decade that water is on Mars, mostly in the form of ice. What's exciting is finding out where the ice is in detail and how it got there. We've reached the next level of sophistication in our questions."